Can it be? September is almost over?! Well, the seasons roll on and so do we here at Saxelby Cheesemongers. We’re switching from our tomatoes and cheese pants to our apples and cheese pants, in a manner of speaking, and planning our final Day A-Whey trip of the year! 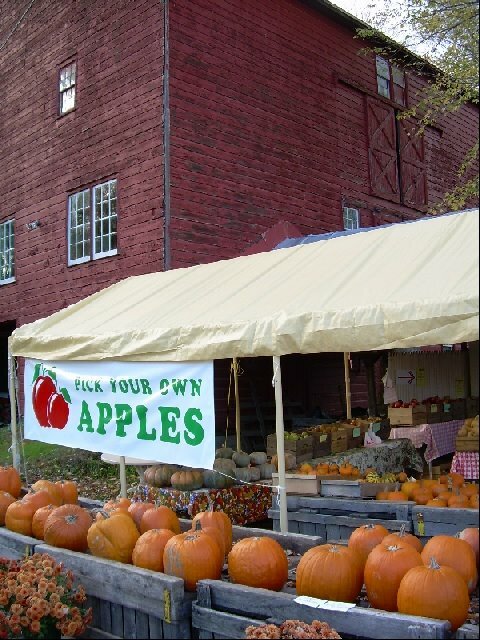 In just a few weeks be heading up to Poughkeepsie (aka Po-Town, Po-Vegas… any monikers you’d like to submit are heartily welcomed) for some tasty farmstead cheese and an afternoon in an orchard amidst some of the most spectacular fall foliage this side of the Hudson. Read on, good cheese eaters, and see what’s in store! We can’t think of a better place to learn about farmstead cheese than Sprout Creek Farm, a lush little parcel o’ green just outside of Poughkeepsie. Margo Morris and Sue Rogers founded Sprout Creek in the 1980’s with the intention of creating a place where kids of all ages could learn about agriculture and get re-connected to where good food comes from. What started off as a summer camp has blossomed into a multifacted year-round farm and market, busting at the seams with home grown produce, jams and jellies, home spun yarn, a delicious array of cheese, and local meats. For our Day A-Whey Margo and her most excellent cheese maker Colin will lead us on a grand tour of Sprout Creek, explaining the ins and outs of running a farm and all the glorious insanity it entails. We’ll begin in the cheese room, learning how farmstead cheese is made, and get a glimpse into the aging caves where all those hearty tommes are matured to perfection. Next, we’ll head out to the barnyard for some sunshine and see where the cows and sheep and goats like to roam, or escape, as it were… (last year there was much excitement when the sheep got out of their pen and ran amok for a brief while) We’ll also take time to visit the chickens, ducks, and greenhouses, rounding out the incredibly diverse range of farmy enterprises in the works at Sprout Creek. After the tour, we’ll be treated to a harvest lunch and cheese tasting in the comfy old barn featuring a splendid spread of local fruits and veggies, freshly baked breads, cured meats, and of course, plenty of delicious fromage!! Daytrippers will have time to sit and dish and picnic the afternoon away, and gather up some goodies from the farm to bring back home. Come afternoon-time, we’ll hop back on the bus and take a quick jaunt over to Terhune Orchard for some late season apple picking. At the end of October, we’ll be munching and crunching on Mutsu, Granny Smith, and big red Rome apples, just to name a few. Terhune is a family owned orchard that has been in the biz for over 70 years, and boasts some of the finest apples these mongers have ever tasted. We’ll take a wander through the orchard and soak up some good fresh air before heading back home, sleepy and sated! So what are you waiting for? The apples and cheese are a-calling, and it’s bound to be a fine farmy day!